(Nanowerk News) By cloaking nanoparticles in the membranes of white blood cells, scientists at The Methodist Hospital Research Institute may have found a way to prevent the body from recognizing and destroying them before they deliver their drug payloads. The group describes its "LeukoLike Vectors", or LLVs, in the January issue of Nature Nanotechnology ("Synthetic nanoparticles functionalized with biomimetic leukocyte membranes possess cell-like function"). "Our goal was to make a particle that is camouflaged within our bodies and escapes the surveillance of the immune system to reach its target undiscovered," Tasciotti said. "We accomplished this with the lipids and proteins present on the membrane of the very same cells of the immune system. We transferred the cell membranes to the surfaces of the particles and the result is that the body now recognizes these particles as its own and does not readily remove them." Nanoparticles can deliver different types of drugs to specific cell types, for example, chemotherapy to cancer cells. But for all the benefits they offer and to get to where they need to go and deliver the needed drug, nanoparticles must somehow evade the body's immune system that recognizes them as intruders. The ability of the body’s defenses to destroy nanoparticles is a major barrier to the use of nanotechnology in medicine. Systemically administered nanoparticles are captured and removed from the body within few minutes. With the membrane coating, they can survive for hours unharmed. "Our cloaking strategy prevents the binding of opsonins -- signaling proteins that activate the immune system," said Department of Medicine Co-Chair Ennio Tasciotti, Ph.D., the study's principal investigator. "We compared the absorption of proteins onto the surface of uncoated and coated particles to see how the particles might evade the immune system response." Tasciotti and his group took metabolically active leukocytes (white blood cells) and developed a procedure to separate membranes from cell innards. By coating their nanoparticles with intact membranes in their native composition of lipids and proteins, the researchers created the first drug-carrying nanoparticles that look and act like cells -- leukolike vectors. 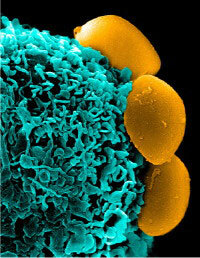 "Using the membranes of white blood cells to coat a nanoparticle has never been done before," Tasciotti said. "LLVs are half man-made -- the synthetic silicon core -- and half made of man -- the cell membrane." Can the membrane be produced entirely via synthetic means? "Being able to use synthetic membranes or artificially-created membrane is definitely something we are planning for the future," Tasciotti said. "But for now, using our white blood cells is the most effective approach because they provide a finished product. The proteins that give us the greatest advantages are already within the membrane and we can use it as-is." As the technology is developed, Tasciotti said a patient's own white cells could be harvested and used to create personalized LLVs. "Cloaked by the patient's own cell membranes, the nanoparticles would be far more likely to reach their targets and avoid the activation of the immune system surveillance," he said. To test whether the LLVs would be protected from macrophage sequestration and destruction, Tasciotti's team tested LLVs coated with human membranes and found that human macrophages left the LLVs unharmed, thus confirming the preservation of the self-recognition principle. Nanoparticle research has generally focused on getting the particles to recognize specific tissue and to release drugs there, and only there. Comparative studies of LLVs' interaction with healthy and inflamed blood vessel cells showed the LLVs selectively targeted the inflamed tumor blood vessels. "LLVs are dotted with proteins that help the particles reach specific targets, from inflamed or damaged tissues to cancer cells recruiting blood vessels," Tasciotti said. "Over time the membrane lipids and proteins will break away, leaving the nanoparticles to degrade naturally after releasing their payload." The research team also looked at how well the drugs traveled through the LLV membrane. They found that rather than introducing an obstacle to drug release, the membrane provides controllable release of the drug once the nanoparticles reach their target tissue. The present study used white blood cells from cell cultures. Tasciotti said one of his group's goals is culturing enough cells from the patient to be useful in drug therapy. "We are aware that we will not always have access to an infinite number of white blood cells," Tasciotti said. "For this reason, we are working to optimize our system by using as little material as efficiently as possible. I expect this technology to become a new player in the crowded world of drug delivery system thanks to the opportunities it offers for the personalization of drug therapies."